(4) Analysis of DNA damage and apoptosis. The eukaryotic genomic DNA exists in the form of chromatin. Therefore, the study of interactions between protein and DNA in chromatin environment is the basic way to clarify the mechanism of gene expression in eukaryotes. 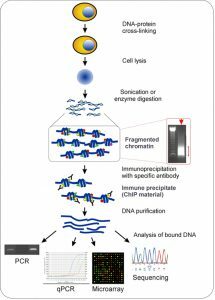 Chromatin immunoprecipitation (ChIP) is currently the only method to study DNA and protein interactions in vivo. Its basic principle is firstly to fix theprotein-DNA compound in living cells; then randomly sheared into ~500 bp DNA fragments by sonication or nuclease digestion precipitate this compound by immunological methods, selectively enrich the DNA fragments fixed with targeted protein; and finally get the information of protein-DNA interactions by purifying and testing the targeted DNA fragments. ChIP can be used to detect dynamic interaction between trans-factors and DNA in vivo and study the relationship between kinds of covalent modifications of histone and gene expression. 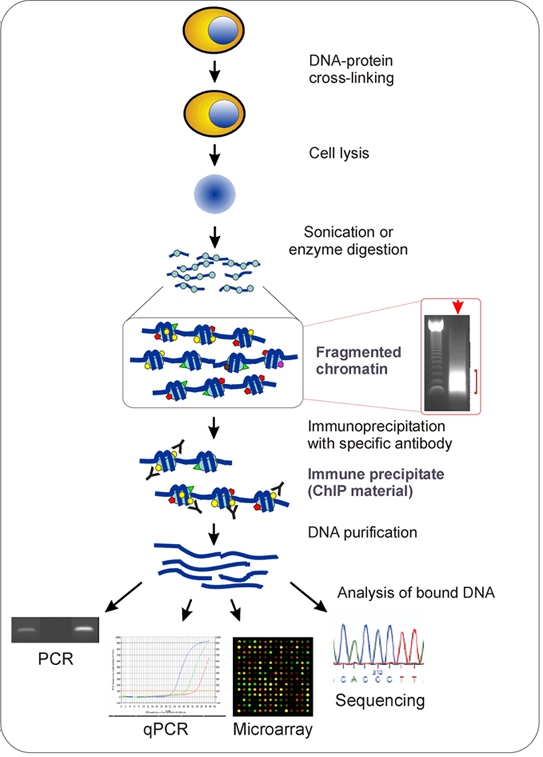 ChIP is a method developed based on in vivo analysis, also known as binding sites analysis, which has become the main method for epigenetics research. This technique helps researchers determine what kind of histone modifications would appear at which/what particular position of the genome in the nucleus. With the histones and DNA binding, the chromatin is sheared into small pieces and then precipitates, by the use of a specific bio-antibody marker corresponding to the histone. At present, researchers usually use refined prorein A which was pre-binding to the agarose beads, so that the prorein A can capture the antigen after reacting with the antigen-contained solution and antibodies. 1. Prepare cells cultured in 10 cm dish; add 243 ul 37% formaldehyde to the mediafor a final concentration of 1% (Total medium is 9 ml). 2. Incubated for 10 min (37︒C). 3. Add 450 ul 2.5 M glycine in the dish to a final concentration of 0.125 M and mix well, stand 5 min at room temperature. 4. Remove the medium, and then wash the cells twice with ice-cold PBS. 5. Use the cell scraper to collect the cells in a 15 ml centrifuge tube (use procooled PBS followed by 5 ml, 3 ml and 3 ml). Centrifuge at 2 000 rpm for 5 min to collect cells. 6. Discard the supernatant; add SDS Lysis Buffer making the final concentration of 1× 107 cells/L. Thus each 100 ul solution containing 1 ×106 cells. Add protease inhibitors. 7. Ultrasonication: VCX750, 25% amplitude, ultrasonicate 4.5 s, break 9 s . Repeat this circle 14 times in total. 1. After ultrasonication, centrifuge at 10000g d for 10 min at 4 ︒C to remove insoluble materials. 2. Take 300ul for the experiment, and store the rest at -80 ︒C. 3. Among the 300 ul medium, take one third added antibody as experimental group; another 100 ul without antibody as control group; And add 4 ul 5 M NaCl(final concentration is 0.2M) to the last part, incubate for 3h at 65︒C, detect the sonication effect by electrophoresis. 4. Add 900 ul ChIP DilutionBuffer and 20 ul 50 × PIC in the 100 ul of sonication product. Then added 60 ul ProteinA Agarose / SalmonSpermDNA and mix by inversion at 4 ︒C for 1 h.
5. Stand 10 min at 4 ︒C for preciptation, and then centrifuge at 700 rpm for 1 min. 6. Collect the supernatant, One tube was added by 1 ul antibody, the other adds nothing. And leave 20 ul of each as input. Reversal mixing at 4 ︒C overnight. 1. Add 4 ul 5M NaCl to 100 ul post-sonication product. Incubate at 65 ︒C for 2 h for decross-linking. 2. Extract half of the product by phenol / chloroform. Test ultrasound effect by electrophoresis. 1. After overnight incubation, each tube was added to 60 ul ProteinA Agarose / SalmonSperm DNA. 4 ︒C, shake for 2 h.
2. Stand for 10 min at 4 ︒C, centrifuge at 700 rpm for 1 min. The supernatant was removed. 3. The precipitated complex was washed with the following solutions. Steps of Cleaning: add the solution, mix at 4 ︒C for 10 min, stand at 4 ︒C for 10 min, centrifuge at 700 rpm for 1 min. Remove the supernatant. 4. After the cleaning is completed, start elution. Eluent recipe: 100 ul 10% SDS, 100 ul1M NaHCO 3 , and 800 ul ddH 2 O, 1 ml in total. Add 250 ul elution buffer to each tubes mix for 15 min at room temperature with rotation,, centrifuge after standing, collect the supernatant. Repeat wash step. The final eluent volume is 500 ul per tube. 5. Decross-linking: Add 20 ul 5M NaCl to each tube (NaCl final concentration is 0.2 M). 6. Mix well, decross-linking at 65 ︒C overnight. 1. Please pay attention to the properties of the antibody. Different antibodies have different ability of antigen-binding. The application of antibody included immunofluorescence may not suitable for IP. We recommend you read the instructions of antibodies carefully, especially the specific of polyclonal antibody. 2. Please pay attention to the properties of the buffer that dissolves antigens. Most antigens are proteins. In particular cytoskeletal protein, for example, a buffer must dissolve it completely. Therefore, you must use a buffer containing a strong surfactant. Although it is possible to affect a portion of the antigen-antibody bindings. On the other hand, if a weak surfactant buffer is used to dissolve cells, proteins cannot be fully dissolved or combined with other proteins which would affect the antigen-antibody bind. Even if the IP is completed, there will be the result of proteins and antibody co-precipitated. 3. In order to prevent proteins decomposition and modifications, dissolution buffer for the antigen must add protease inhibitors, and the experiment should be conducted at low temperature. Consider the antibody/ buffer ratio before the experiment. ChIP-ChIP technology made outstanding achievements for large-scale screening of cis-regulatory information, and it can be used for mechanisms of embryonic stem cells and occurrence of some diseases such as cancer, cardiovascular disease and central nervous disorders. Researchers can also use the technology to develop some therapies. (3) Directly or indirectly (through protein-protein interactions) to identify the sites between genome and protein. (3) Have to obtain the regulate protein gene from tissue sources.. 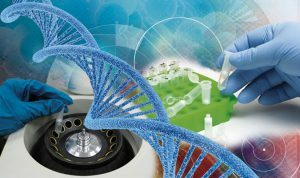 In short, the development of ChIP-ChIP technology provides an extremely powerful tool for the analysis of the relationship between DNA and protein in living cells or tissue. In future, we will improve the applicalbility of Chips and use easily obtained antibodies. The traditional approach is semi-quantitative –PCR in. But now, real-time PCR is preferred to use. There are also some techniques derived from ChIP. For example, RIP is a method like ChIP to study relationship of protein and RNA. However, you should prevent activity of RNase; and before the final analysis, you need to reverse transcript RNA to cDNA. Another one is ChIP-chip, which analyze the relationship of DNA and protein by chips.